IMCS WERE CREATED THANKS TO THE RAILROADS’ DECISION NOT TO SELL DIRECT TO SHIPPERS: Instead, they sell wholesale to IMCs that perform intermodal sales and marketing. IMCs are intermodal advocates for the Class I railroads. Intermodal asset versus non-asset providers aren’t the same as asset and non-asset truckload. No one intermodal company that owns all the assets in an intermodal move. As we talk to shippers across North America on the merits of intermodal, we continue to hear “you are just another broker” that does not have assets. Well, we’re here to shout from the rooftop that a true intermodal marketing company (IMC) is not “just another broker” moving another company’s assets, but an advocate for the Class I railroads through the utilization of the Class I’s assets. The prior statement is contrary to the marketing materials coming from “asset intermodal service providers” (bi-modal intermodal providers). The reality is asset versus non-asset cannot be delineated in the same way as asset and non-asset truckload providers can be explained because there is no one intermodal company that owns all the assets in an intermodal move. The bi-modals, meaning the JB Hunt’s of the market, own containers, chassis and some (not all) of their dray capacity. The bi-modals do not own the trains, rails, and intermodal ramps nor do they employ the railroad team. On the other hand, railroads own 53-foot intermodal containers, rail infrastructure, intermodal ramps, systems, processes, and the intermodal teams. The difference and confusion in the intermodal marketplace comes in the fact that Class Is do not sell direct to shippers, but through IMCs. To add to the point on the term “assets,” in the intermodal space is the Class I Railroads own more 53-foot intermodal boxes than the largest bi-modal provider. IMCs were created as a by-product of the railroads’ decision, during the development of the intermodal service, not to sell direct to the shippers market. Instead, railroads chose to sell wholesale to IMCs that would perform the sales and marketing for their intermodal service. Over time, IMCs evolved to provide not only sales, marketing and pricing, but also operational work needed by the shipper, including securing the container, dray capacity, routing, and track-and trace through delivery. This process looks exactly like a brokered truckload move to shippers, which is where I believe the confusion between an IMC and broker started. IMCs work directly with the railroads and has the full faith and backing of the railroads’ resources, while a broker is working with IMCs. IMCs also provide a layer of customer service support and reporting shippers are accustom to receiving from their other transportation mode purchases. They give shippers one-call access to all west and east coast intermodal origin and destination combinations, since there is no one railroad that covers all the North American intermodal ramps. The railroad-IMC model is a great model, but some shippers have come to believe an IMC is “just a broker” without assets because the operational aspect of an IMC is very much like tendering a load like a truckload broker, while the reality is they are customer interface for the railroads. 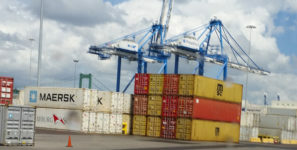 IMCs can appear to be small, compared to the 800-pound gorillas in the intermodal space because of the marketing punch and the number of IMCs in existence. With that said, though, consider the resources behind the IMCs that sell the railroad’s container capacity. In our particular situation, R² Freight & Logistics is an agent of Sunteck-TTS, a $1.0-billion asset and non-asset logistics company which is tied for #7 on the listing of the Largest Domestic Freight Managers. To sum up this blog, IMCs like, R² Freight & Logistics, stand toe-to-toe with the bi-modals by providing North American Class I Railroads asset boxes to the market. So, the market question is, is it more important to own the boxes, dray or ramp interchanges at origin and destination. Well, the Class I / IMC model is the only one that owns all three. The bi-modals only own boxes.